Harvests in June - stores into winter. Texas Rose has long been a gardeners favorite among south Texans because it is an early harvesting , richly flavored light-to medium pungency garlic that has a lot of color and grows almost anywhere. That's a lot to like in a garlic that when properly grown and stored will keep through the winter. 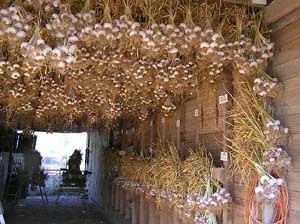 After a few months of having no garlic, Texas Rose gave gardeners an excellent garlic weeks before most other varieties and it is a prolific grower and a good commercial garlic. It matures after the mild Red Toch and before Inchelium Red, which is a little stronger most years. It does seem to tolerate hot spring weather well and stores well also. Texas Rose ranks 4-5 on the garlickiness scale and 3-4 on the pungency side. It has a semi-rich flavor and a little bite, but is still on the light side. The difference healthy soil and careful handling makes is phenomenal in all garlics. When grown and harvested properly, Texas Rose is an excellent all- around general use garlic and an excellent baker. 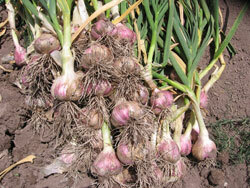 It's a very good growers garlic as it has many large cloves and it stores well under proper conditions. It has been grown extensively and loved in the south Texas area for decades under the name of Hallettsville but has been renamed Texas Rose for brevity and marketing purposes and it is a dependable and very flavorful garlic that stored well.